The new SanDisk V-MATE device lets consumer’s record video to flash cards from TV, cable and satellite set-top boxes, DVD or VCR players to play back on mobile phones, PDAs, handheld game consoles, and video/music players. The ground-breaking SanDisk V-MATE is a video memory card recorder, allowing users to record video from video inputs such as over-the-air television as well as cable, satellite, DVD players, personal video recorders (PVRs) like TiVo and video cassette recorders (VCRs) onto their flash memory cards. Consumers can then take their memory card from the V-Mate and insert it into their mobile phone, PDA, handheld game console like the Sony PSP (PlayStation Portable), video music player or notebook computer to play back their videos on the go. The SanDisk V-Mate lets users record up to 3.5 hours of high quality video per gigabyte, using industry-standard video formats. Memory cards supported include SD, MMC, MMCplus, MMCmobile SDHC, MiniSDHC, MicroSDHC, Memory Stick PRO, Memory Stick Duo and Memory Stick PRO Duo. 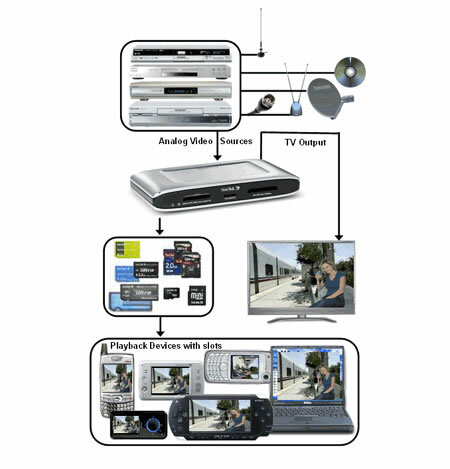 With a maximum recording resolution of 640 x 480 pixels, the V-Mate can also generate recording files for playback on larger screen devices such as the TV it is connected to or a notebook. The unit includes an infrared emitter. This will automatically turn on the TV tuner box (cable/satellite/terrestrial receiver or VCR) and select the right channel when programmed to record. The V-Mate measures just 5.1” x 2.6” x 0.8,” so it will fit snugly next to almost any-sized television. The SanDisk V-Mate, expected to be available in October 2006, will sell for $129.99 MSRP.